Yahoo has re-launched Yahoo Clues, a trending service which enables users to view content that is being searched on the web by other people. The service was first launched in November 2010. The original single page version has been refurbished and new additions have been made like maps that show the point of origin of the searches both locally and globally. Also, information on searches will not be limited to those being done in the US; rather information on searches being done around the globe will be provided. 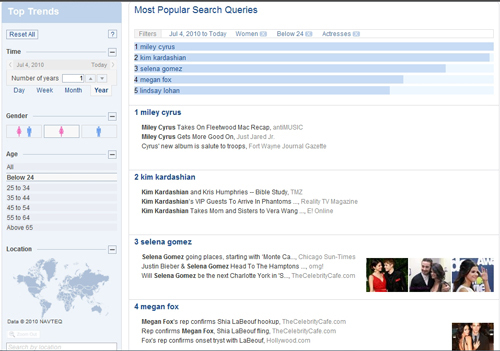 A new feature called 'Top Trends' has also been added that enables the users to filter data by age, gender, place, time periods and search category. "Yahoo Clues is already in use by Yahoo Editorial to spot and understand search trends, then translate this insight into news generation, content programming, or to share with our partners. In addition, the new Top Trends feature allows our users and editorial team to continuously monitor and browse for interesting or unexpected trends regionally or within a specific demographic." said Brian Theodore, director of search products at Yahoo. If the company wants to popularize Yahoo Clues, they will have to tackle competition in the form of Google Trends and Google Insights from search giant Google which currently is the biggest search engine provider with more than a billion unique visitors in the month of May this year. The company had earlier launched Apps.Search.Yahoo.com (an online search) and Y!Appspot (an application) to help users in finding applications for iPhones and Android mobile phones.